Jonathan Parker knew by the age of five that he was destined to be a chef. By the age of fifteen Jonathan attended the local college, beginning his basic culinary training. Jonathan’s training took him from Somerset, then to London where he completed an apprenticeship in the acclaimed West End hotels. Jonathan then had the opportunity to work at The Hotel Majestic on the French Riveria, working in Nice and Cannes as a chef saucier. After meeting his wife they settled in Manhattan where Chef Parker had the great fortune to work with such culinary geniuses as Thomas Keller, and the late culinary great Gilbert LeCoze at the renowned Le Bernardin. Chef Parker attests that his time spent in the kitchen of Le Bernardin in Manhattan was his most influential experience professionally. In 1989, Chef Parker began working with Alan Stillman as the executive chef at the Manhattan Ocean Club, a noteworthy seafood restaurant, where he would stay for fourteen years. 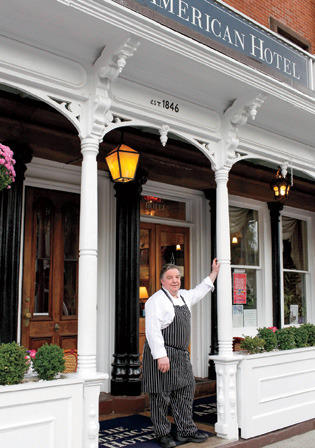 Chef Parker began offering our guests at The American Hotel his creative and thoughtfully prepared culinary delights in December of 2008. Ted Conklin’s continued success in providing impeccable service to The American Hotel’s valued guest’s pairs perfectly with Chef Parker’s attention to detail and exceptionally high standards. Chef Parker only utilizes the highest quality local and seasonal ingredients from the vast resources we have here on the East End. It is a pairing as complimentary as our local Peking duckling a la bigarade with a bottle of Pommard.